The Legislative Committee met following last year’s session in order to review and incorporate any new resolutions affecting legislative affairs into the Connecticut State Grange Legislative Policy Handbook. Copies of the Legislative Guide were then sent out to all Connecticut granges and distributed to Governor Malloy, Lt. Governor Wyman and all members of the Connecticut General Assembly. 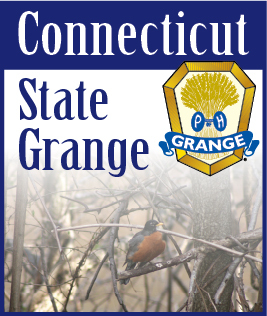 Gordon Gibson again represented the Connecticut State Grange at the Capitol. He is well recognized by many legislators and works with other lobbyists in following the bills and communicating our support and/or concerns on the various bills before the General Assembly. The budget was the hot topic in the legislature this year. The Governor presented his budget early in the session as usual. Both the Democrats and the Republicans did not like it and have been negotiating with the Governor on a compromise budget with little success. The legislature ended the session with no budget and no compromise. Months later, budget negotiations are still ongoing between the legislature and the Governor, making Connecticut the only state that does not have a budget. The Governor has been running the state without a budget which has resulted in tremendous negative impacts on our towns and cities. Due to the volatile state of the budget this year we did not get the opportunity to testify on any bills. Very few bills actually passed the legislature this past session. One of the few notable bills we watched concerned the Community Investment Funds monies. The bill proposed adding an amendment to the constitution which would create a separate fund in the General Fund in which the CIA monies would be placed. This would keep these funds in a separate non-lapsing account. Unfortunately this bill died in the legislature. One notable bill that did pass was one concerning the siting of solar panels on farmlands. This requires the siting council to take into consideration the impact on farmland and forest lands in their decision. Gordon and I attended the Connecticut Agricultural Day in March at the Capitol. Governor Malloy stopped by the Grange booth for a photo. I attended a rally at the Capitol to show support of HJ99 which was the bill protecting the Community Investment Act monies. Gordon Gibson attended the Working Land Alliance annual and regular meetings during the year. The Grange is a partner of this organization. He also participated in a phone town meeting with Representative Joe Courtney where they discussed Connecticut’s agricultural needs. Gordon was invited to represent the Connecticut State Grange at an invitation-only meeting with U.S. Secretary of Agriculture, Sonny Perdue. Secretary Perdue was stopping in states for listening sessions concerning the 2018 Farm Bill. The Grange asked for greater flexibility in national agricultural regulations by asking that states USDA offices be able to modify programs to better serve the farmers in Connecticut. Gordon was quoted in the Norwich Bulletin as saying “one size does not fit all”, in which Secretary Perdue agreed. There were also discussions with Perdue on the challenges that the farmers have with the regulations tied to the Food Safety Modernization Act. I would like to thank our State President, Noel Miller, for giving me this opportunity to serve as your Legislative Director for this year and extend thanks to my committee, Charles Dimmick, Russell Gray, George Ward and Gordon Gibson for their work and support.